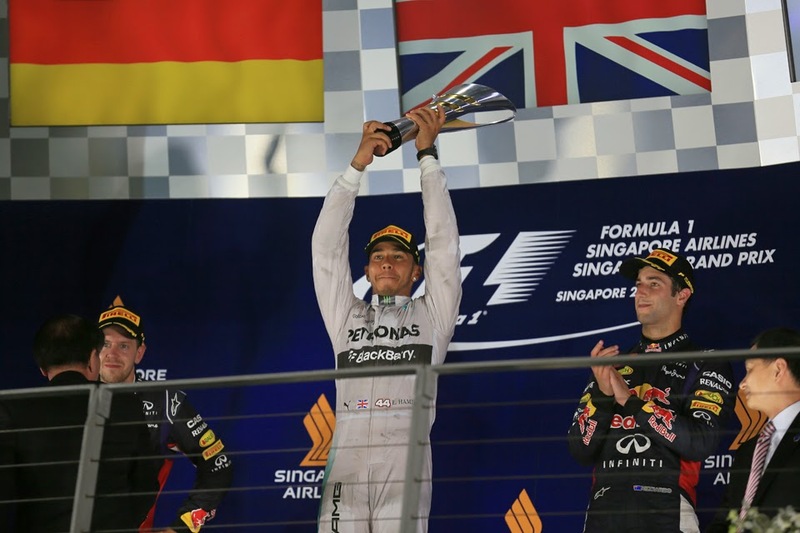 Lewis Hamilton indeed won the Singapore Grand Prix, and even better from his 2014 world drivers' championship point of view, his stable mate and title antagonist Nico Rosberg didn't trouble the scorers at all. For all of the learned comment about what laid ahead in this particular mano-a-mano fight, and of Rosberg's continued advantage, it remained fact that Lewis was within a single race of getting on top of the table in his team mate's stead. It just required everything to go his way. Today it did. The maximum 25 point swing means he all of a sudden leads the drivers' standings by three. Indeed Nico's race barely started. The first sign of trouble was when he rather than head to the grid after his reconnaissance headed instead back to the pits, and to be wheeled back into the garage. After some frenzied activity including changing his steering wheel he made it into his starting slot. But the problem clearly was unresolved as he then was left on his mark as everyone else proceeded on their warm up lap. Nico did get going from the pit lane, but hardly made much progress in the race itself as the mechanical woes continued, the car shifting up two gears at once and being without ERS or DRS (as it transpired due to a faulty electrical loom in the steering column), all totalling up to him lapping five or six seconds over the marks of Lewis out front. He even was unable to clear the luminary of Marcus Ericsson's Caterham. Come the first stop it was game's a bogey for him, as without a clutch he couldn't re-start. From then on from the championship angle it was merely a matter of whether Lewis could make it to the end and in first. The latter point for much of the way didn't look in much doubt. Lewis appeared in total command and with plenty of extra pace to deploy if he needed it. The anticipated Red Bull challenge didn't really materialise; Sebastian Vettel just about clung to his coattails early on but even he had to give in partway through the first stint. 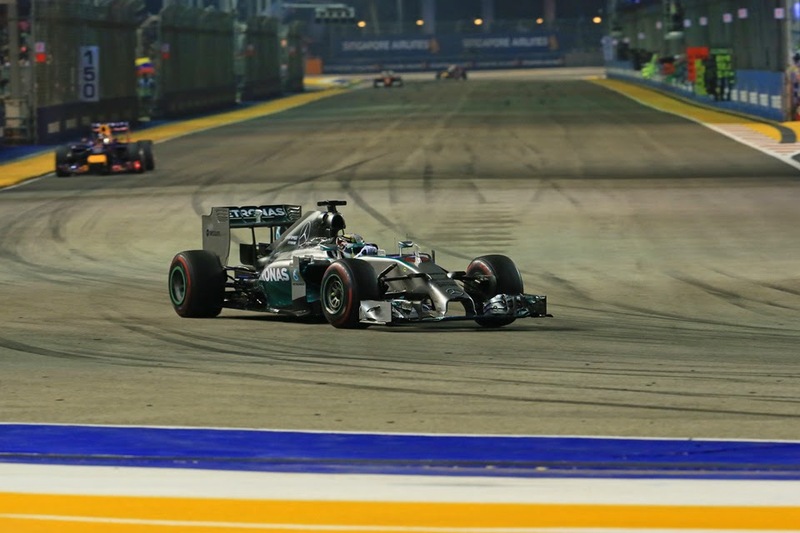 One thing did threaten Lewis's win however, though typically it was not an opponent as such. 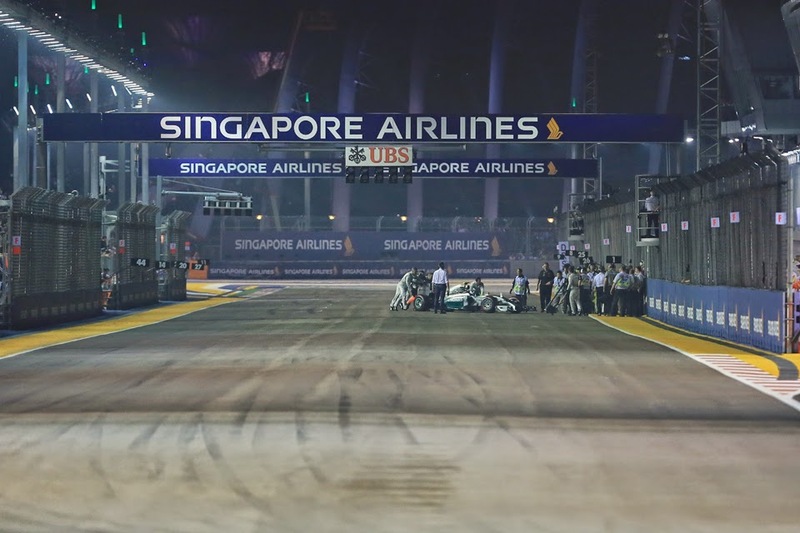 Rather it was an inevitable Singapore safety car. It appeared with 30 laps left, and left Lewis high and dry somewhat on used supersofts - and having not used the softs yet - within just about everyone stacked up behind trying to go to the end on softs. Lewis therefore needed to scamper off and get a gap that would allow a pit stop ideally without losing his lead - some 27 seconds was the consensus. After the safety car went back in it looked easy meat - Lewis was 3.2 seconds ahead after a single tour of green flag action, then 5.5 seconds, then 7.6. It went up time after time, but the rate of increased tapered off a bit as Lewis's rubber started to wilt. Fortunately those behind, now led by Vettel, started to have problems of their own. Lewis didn't quite get the 27 seconds, but after his stop had fresh rubber on his side and the rather trifling task of clearing only the by now seriously grip-deprived Vettel to reclaim the lead. Sure enough he did this in short order (though Seb was a little grumpy about the risky nature of the pass), and that was that. As for the rest they'd post-safety car boxed each other into a corner by each seeking to stretch a single set of soft tyres to the end, most not wanting to pit given the resultant loss of track position. 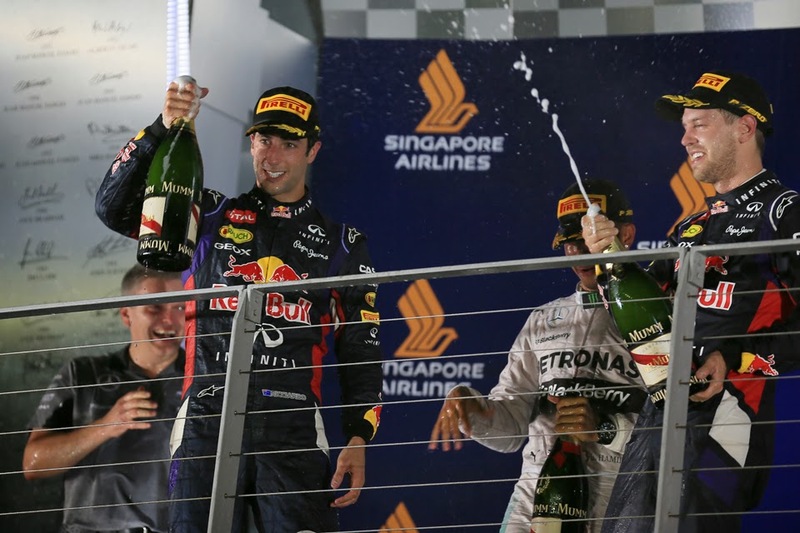 Vettel crawled home second, with his team mate Daniel Ricciardo and Ferrari's Fernando Alonso right behind in that order. All three had put in mighty efforts. Seb will be glad to have been best of the rest and to have put in a timely good performance on a track that's always been kind to him. Still he was frustrated that once again he wasn't really able to take the fight to the silver cars. Ricciardo on a day that Rosberg got zero just about resisted the pull away from the title reckoning outer periphery for another fortnight. While Alonso was a little bit of a bad luck story, as he was looking good for second place but the safety car didn't really do him favours and rather forced him to pit and lose places to the non-stopping Bulls. Where he stayed. But it might not be the whole story. Lewis - perhaps as some kind of mystic - noted prior to today's race that while a DNF would likely destroy his own title chance definitively Nico could afford one. He's now had it. And in more than one way it feels now a lot like were starting from scratch - set for a five race shoot out almost like the NASCAR chase. But still, if random chance and its resultant grand shift of things can happen then it can happen again. Another bout of Mercedes malady - or indeed another bout of another weird occurrence - could alter the complexion beyond recognition just as today's did. And in either driver's favour. Lewis indeed seemed mindful of this afterwards; 'It's a great feeling coming into a weekend knowing you'll have a car you can fight with...but it's (reliability is) not perfect, we've still got things that come up, catch us unaware, catch us off guard, as you saw today with Nico's car...I think with the issues that I've had of course it haunts me every weekend you never know when it's going to pop up. You just have to remain positive...'. And while the unmistakable sense of momentum is now firmly in Lewis's possession, a recurring theme of this season is that Nico is not one who's going to go away easily, on pace or on anything else. This weekend too he was matching his team mate toe-for-toe pretty much the whole time. And he's surprised us before in 2014. That's one thing that wasn't changed by today's Singapore Grand Prix.